The next great Big Science facility, based on the world's most powerful neutron source, will make possible 'the new science'. Today, there are several research facilities based on neutron sources in Europe, which raises the question, "So why do we need another neutron facility?" Most existing sources are based on nuclear reactors, an approach that has reached its maximum capability and cannot be developed further. It is time for a new approach to neutron science in Europe. Single-pulse source brightness as a function of time at a wavelength of 5 Å at ESS, ILL, SNS, J-PARC and ISIS target stations 1 and 2. In each case, the range of moderators appropriate for that wavelength is shown. Brightness at ESS is shown at both 5 MW accelerator power and at 2 MW accelerator power. For everything from motors and medicine, to plastics and proteins, detailed studies are dependent on how many neutrons can be produced by a neutron source. This is a significant limitation for existing sources which are based on nuclear reactors. As a result, scientists and engineers have developed a new generation of neutron sources based on particle accelerators and spallation technology, a much more efficient approach. ESS will provide up to 100 times brighter neutron beams than currently available at existing facilities. In simple terms, the difference between current neutron sources and ESS is something like the difference between taking a picture in the glow of a candle or using a torch. The limitations of reactor technology have long been known, and it is the consensus among neutron scientists that increased spallation capacity is a necessary step forward. With an improved source there is also the need for ESS to develop increasingly sophisticated instruments and detectors. Better sources and better instruments means exponentially more data to collect and analyse. That means the scientists doing research at ESS must be positioned to take full advantage of the last decade of exponential growth in data management capacity and computational power. As a Greenfield project, built from the ground up not only physically, but organisationally and philosophically, ESS is positioned as the vanguard of the next century of experimental science and the world's next great Big Science facility. Neutron scattering is a very important tool of the study of matter, which is used by nearly 6000 researchers around Europe in studies spanning an extremely broad field, from archeology to life science, from materials for aerospace applications to energy storage, from quantum phase transitions to car fuel additives. Today 10 medium- and major-size neutron scattering user facilities across Europe provide a total of approximately 25 000 instrument days per year for this group of users, about four days per person, for both carrying out new research and to train students and young scientists. With 22 instruments fully operational, ESS would add about 4000 instrument days, that is, less than one day for each current user. The average duration of neutron scattering experiments at Europe’s current suite of neutron user facilities is about a week. The breakthrough ESS will bring to research...is to open up whole new fields of capability...that were impossible to study with neutrons until now. So in terms of capacity measured in instrument days made available to users, ESS will be on the scale of the existing major neutron sources. 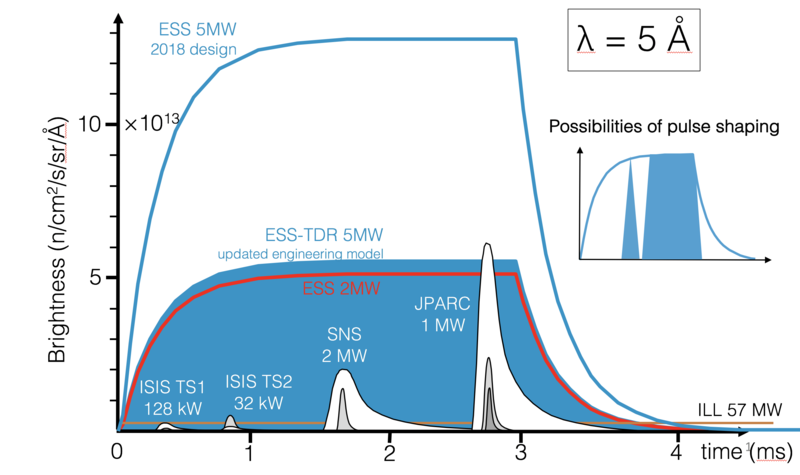 The breakthrough ESS will bring to research, by its up to two orders of magnitude higher source brightness compared to other sources worldwide, is to open up whole new fields of capability for exploring samples and phenomena that were impossible to study with neutrons until now. A very instructive example is biological research. Many sample materials of great interest can only be produced in milligram quantities, for which we would typically need to collect data for a full year on the best existing instruments for a single experiment. With four days available per user on average, there is no way this could be envisaged. With the new level of source intensity of ESS, the same experiment will be achievable in 3-10 days. The duration of any experiment consists, on the one hand, of alignment, adjustment and parameter changes and verification times, which are pretty independent of source neutron performance and can hardly be compressed to less than typically a day. On the other hand, the actual neutron data collection time is inversely proportional to the neutron source intensity. An experiment that can be done at ESS in one day can also be done at the other neutrons sources over a little longer time, but still can be done. What can be done at ESS in one week or two weeks cannot be done anywhere else. This is where the new science is. ESS Technical Coordinator Ferenc Mezei is a member of the Hungarian Academy of Sciences and of Academia Europaea. Mezei is the inventor of the neutron spin-echo spectroscopy method, which has had far-reaching implications for the understanding of polymers, proteins, glasses and magnetic materials. He has received several prestigious scientific awards, including the first ever Walter Hälg Prize from the European Neutron Scattering Association.